SVÄRTAN is a collection which is the result of a collaboration with the Swedish textile designer Martin Bergström and Indian fashion students. Using only black, white and shades of grey, SVÄRTAN invites us to explore a side of India that goes beyond the vivid colours usually associated with this striking country. 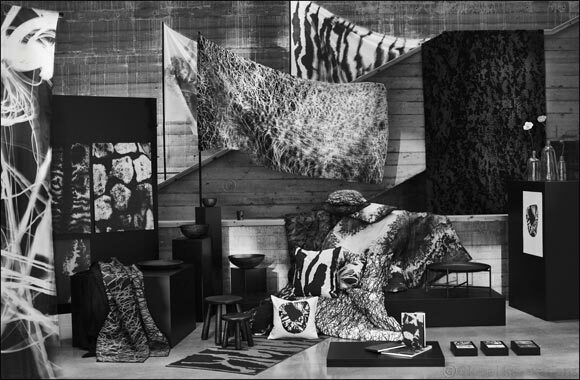 IKEA is launching SVÄRTAN – a collection which is the result of collaboration with Swedish textile designer Martin Bergström and Indian fashion students. Using only black, white and shades of grey, SVÄRTAN invites us to explore a side of India that goes beyond the vivid colours usually associated with this striking country. Consisting of textiles, paper items, glassware, ceramics and metal objects, inspiration for SVÄRTAN has been drawn from inner-city environments of India. The collection is full of subtle textures and abstract patterns taken from objects that are usually overlooked, encouraging us to see beauty in the seemingly mundane. “My idea was to create a modern interpretation of India and its heritage, a country with designs that are perceived in the West as colourful, golden and shiny,” says Martin Bergström. Swedish fashion and textile designer Martin Bergström has been working in the fields of fashion, art and design for over a decade. Known for his bold and avant-garde designs, he uses everything from ink stains to forgotten handicraft techniques to bring his ideas to life. The entire SVÄRTAN collection has been produced in India and uses many traditional techniques together with natural materials, while the final production is more industrial in nature. This has given each item a handmade look that pairs well with its design. With so many different materials and objects in play, it is the black, grey and white designs that keep the collection together; where patterns are woven, printed or appear as textures. To create an image of what contemporary India looks like, 25 students from NIFT (National Institute of Fashion Technology) in New Delhi were invited to a workshop with Martin Bergström. The students used inspiration coming from unexpected places; patterns in surfaces and distressed walls, from dangling cables hanging over the streets, and then made imprints or drawings of them. The goal was to strike a balance between the organic and the abstract, to find poetry in things that some people may overlook. With their angular, slightly unpredictable look, these mouth-blown glassware pieces are a good example of bergström’s perfectly imperfect designs. The metal tray table is easy to fold away and comes with a pattern you’ll want to reach out and touch. A metal bowl adds weight and a wooden plate gives a softness – the materials used in the svärtan collection are made to complement and balance each other. The metal items come with a hole in them - since that is how they are hung up in India when the paint needs to dry. Martin decided to put a replica of his nose ring into the hole and made it part of the design itself. Available in two sizes and with a slightly robust and rugged quality to them, these wooden side tables can just as well be used as stools. To give them a sturdiness you can both see and feel, the bowl and candleholder are made of coated aluminum. Textiles are a big part of india’s heritage, which is why they’re highly present in the svärtan collection. Patterned or solid black – the thin, soft, wool throws are made to comfort and come in two sizes. Made of 100% cotton, the svärtan metre fabrics are both sheer and reversible. Svärtan cushion covers come in five different patterns and two sizes. These flatwoven rugs ensure no floor looks plain and are available in two different sizes. Svärtan sketchbooks contain thick paper and are produced by a manufacturer that’s been in business for 300 years. Svärtan can literally be admired as works of art thanks to posters that come in two sizes and four different prints.